By Irving Air Chute Ltd. Fort Erie, Ontario, Canada. Lovely rare Royal Canadian Air Force issue seat type parachute assembly. 'Irvin Standard Air Chute Parachute, Single point, quick release with seat pack'. The assembly is complete with classic Canadian type white webbing without a central fleck. It has a fully rounded quick release box (QRB), waistbelt, ripcord housing, ripcord/handle and backpad. The parachute pack itself is manufactured in olive drab coloured canvas and has manufacturer information and serial number printed/stamped directly onto it. 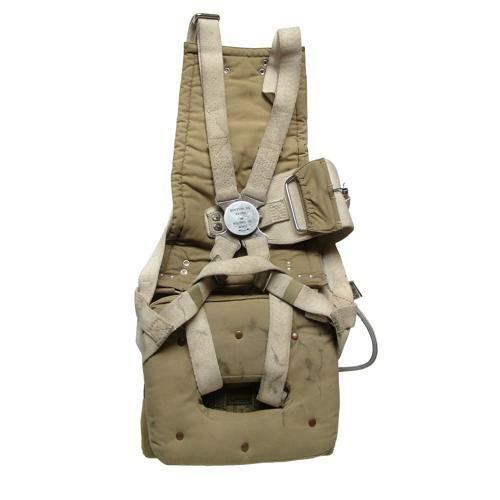 Condition of the harness is in excellent and has Irvin manufacture details between the cross straps. There is a label but nothing has been marked on it (ever). The pack is in excellent condition and fitted with more recent bungee straps (1970s). The backpad is equally good and stamped with Irvin Air Chute details. A good unmarked seat cushion is attached. The assembly is complete with full canopy and pilot drogue. This has full rigging lines and is believed to be attached to the harness but we have not unpacked it in order to check. The original Irvin log book is stamped with matching serial number to that on the pack. It has details of checks undertaken in March 1944, March 1945, August 1946 & July 1949. A final entry notes that the pilot drogue 'chute has been changed and new bungees fitted.' A super example of a rarely found seat harness. This makes an impressive display piece. Stock code M22949.